. I think it is time. I would like your help. Please share your comments and experiences in the comments. Thanks very much. 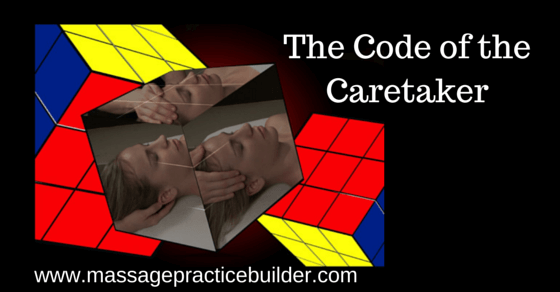 The Code of the Caretaker Explained. How we got this way. 1. The Code of the Caretaker Explained. You stay a little longer to get another client in at the last minute when you already had plans to be home for dinner. You charge less than the going rate thinking that it will get you more clients or you offer a special deal on group buying sites only to find that most only want the cheap massage and you are left feeling restful. You offer free massage sessions work at heavily discounted rates, thinking it will get you more clients. You give your client your best advice and opinions, thinking it will help and then they don’t take it and go on living in pain or under stress. You know you did your best by giving the advice and are disappointed in the client when they don’t take your advice. You may even feel like you will need to terminate your relationship with them, because they just are not getting better and you are sure it is because they are not taking your advice. These are all examples of something called ‘caretaking’. I first heard about the concept of ‘Caretaking’ after reading a series of articles by Jack Blackburn of www.presencingsource.com. There is a difference between ‘caretaking’ and ‘care giving”. When we caretake we assume responsibility for our clients’ healing. When we caregive we support clients in assuming responsibility for their own healing. When clients bring their issues to us, we assume that they are coming to us for our advice and help. After all, we are the experts and have had a whole year of training. We forget that they are coming to us for a massage. Everything that we do is to meet a need that we have. We choose our careers in the helping professions such as massage, needing to participate in making others feel better when it is often really you that needs to feel better. We become helpers/caretakers so we don’t have to look at ourselves. We see so clearly what others need, but what is it that we really need? We do for others to make ourselves feel better. We do for others what we so desperately needed as a child. We ‘fix’ others to make ourselves feel better. When we attempt to get our needs met through our own practice, we end up feeling used, taken for granted and burned out. We feel resentful having to massage all of those people, when it is you who should be getting that massage. We become over attuned to others needs hoping that they will do the same for us. We often give up our needs at an early age because we can’t bear the pain of not getting them met. Giving up our own needs just continues the cycle of abandonment. Caretaking is taking over treatment or care of a person, who cannot provide care of themselves. In bodywork, caretaking can be temporarily helpful for the client in distress. Practitioners at times may assume a caretaking role when clients are experiencing physical, mental, or emotional instability and do not feel up to making their own choices, goals and outcome of treatment. Caretaking is inappropriate when it derives from the practitioners need to be needed…to foster client dependency. Caregiving is giving care, aid, help, assistance, treatment, attention to a client. There is no obligation on the part of the caregiver to produce certain results. Our chief obligation is to be present to our clients and the therapeutic process as possible. The receiver of care remains fully responsible for his/her own care process, including the choice of practitioner and goals of care. Caretaking is doing something for others thinking we will get something in return. We hope they will love us, approve of us, accept us or know what we need. When we give to get something, it become manipulation because we have an expectation that something should be give back besides our agreed upon fee. We blame our failure on the economy, the office mate who took our clients, the boss who did not value us enough to pay us what we are worth. The thing is that there is such a fine line between caretaking and caregiving that we often really do not know the difference. We could easily be offering our valuable time as a marketing tool to get more clients. We could be giving free massage to really try to get more clients in the door. The difference is really the intent of the actions and they can also get easily switched when marketing efforts fail. The constant challenge is to be working on yourself and taking enough care of yourself, to be more aware of your issues around caretaking. It is important to always be looking at whose needs are being met – your needs or the client’s needs. It honestly is most always a mixture and often difficult to distinguish whose needs are being met. That is really the purpose of supervision and peer supervision groups. When a session is predominantly being given as caretaking rather than as a caregiver, it is most often our wounded self that is running the show. Feelings of not making enough progress with clients. Feeling like you have to ‘fix’ a client. It isn’t about the money. I give massage as a token of my love and nurturing abilities. You would rather live in ‘noble poverty’, than to charge more or have more clients. You believe helping people is more important and it is often at the sake of your own health or income. No matter what you do, it is never enough. Believe that your advice needs to be taken and you have done all you can to help this person. If they are not getting better, it is not your fault. You have done all you could. After all I have done for them…. Thinking you know what needs to be done and what is best for every client. That last bullet point – wants to help people is also a very big part of this. One of the main reasons why people want to become massage therapists is to help people. The need to help is often a disguise for other things. Ram Dass talks about helping in his book “How Can I Help” which was something that I read in massage school 28 years ago. When I first read it, I didn’t think much of it, but about 10 years into my career, I found it again and was blown away by it’s insights and impact and ties into all these caretaking traits. Somewhere in the need to help is usually many underlying motives – a need to feel better about yourself, a need for approval, status, to feel useful. It may be because we have a difficult time facing others pain because the pain we have is so great. We enjoy the status of being a ‘health professional’ and the power that comes with it. We love being the source of another’s well being. ‘We gotta’ fix this up right away…It’s tricky, because this impulse may arise from genuine empathy, but the form of action is compulsive. Often what is happening is that we gotta get rid of someone’s pain because it is hurting us too much. Helping is often really also the cause of burnout in the massage profession. We help too much. We take discounts. We work without breaks or many hours, sacrificing ourselves for the sake of giving a massage. The concept of helping is more deeply addressed in a few books by Gerald Corey – Issues and Ethics in the Helping Professions and the book Becoming a helper which is more for the psychology profession but really needs to start being applied to the massage profession. The focus of both books is to take a much deeper look at what YOU need personally and professionally to be the best helper possible and to clarify what YOU get from helping others. It will give you insights on how to work more effectively with people and will give you insights into what YOU are really needing and to learn to get those needs met. When you are more aware of your own needs and what you are getting out of giving massage, you can start learning when they are influencing what you do in a session so you can keep the session focused on the clients needs and the therapeutic relationship that is so important. People who meet their own needs at the expense of their clients, are providing compromised care. Clients deserve to have the highest quality of care. One last article that has really made an impact on my own process and understanding of this all is an article by Rachel Remen MD, called “In the Service of life”. Here is the article in full. Remen also asks the question – How can I serve? Serving is different than helping. Being of Service is about seeing people as being whole no matter what state of health they are in. People who are in pain or under stress really just want to know that someone cares. They don’t want to be fixed or helped. When I talk about serving here it is not like being a server in restaurant or bar. It is nothing like that. When we serve, we know that we belong to life and to that purpose. Fundamentally, helping, fixing, and service are ways of seeing life. When you help you see life as weak, when you fix, you see life as broken. When you serve, you see life as whole. From the perspective of service, we are all connected. All suffering is like my suffering and all joy is like my joy. The impulse to serve emerges naturally and inevitably from this way of seeing. Lastly, fixing and helping is the basis of curing, but not of healing. It isn’t about being perfect and having all of this down. There isn’t a right or wrong way here. There isn’t only one way. This is a process of unfolding and relearning. It is a process of learning about yourself and learning to take better care of yourself and it isn’t always perfect – far from it. How the Massage Profession Makes Us Fix and help. In many ways, our profession as a whole is caught up in fixing. The whole process of going to massage school and getting a license is focused on teaching you how to fix. Our quest for wanting to learn more techniques to find that one perfect method that will ‘fix’ everyone, everytime. We want more techniques to hide our insecurity and low self esteem that says we need to be more and know more and have the answer to everything. Healing happens when we can say “I don’t know” and we can allow the client to come to know their own wholeness. They are a whole person, with whatever malady they have brought to the massage table. Our presence is really what heals and the therapeutic relationship is where it all happens. Massage techniques are just different methods to touch and build that therapeutic relationship. It is more about connecting through touch. They don’t really care if we are performing a triggerpoint release, a craniosacral release or a pelvic lift. All they know is what they feel when they are touched. Touch gives them a sense of themselves and their aliveness or it could also give them a deeper sense of their own pain and depression. The whole medical massage or clinical massage dilemma continues to demand that we fix and show how we fixed them through our SOAP notes. When we bill insurance companies for medically necessary massage, we need to show improvement or risk not getting paid. It often focuses on just getting the client back to work rather than being pain free. We constantly have to learn more and be more. From every angle we are constantly asked to ‘fix’. We become massage therapists wanting to help more. It is the foundation of our work – or is it? Could there be something more to being a massage therapist than helping others? I hope to explore that more and to get to a new way of being for massage therapists. Chapter 2. How do we get this way? Whoa…..now and again with all the info thrown at us from many directions a gem drops in our lap. Your article really spoke to me and I related to much of it. I hope to use the reminders and many of the points made each time I lay my hands on someone. I know I talk to much at times with some clients. Sometimes it to much about ‘my stuff’. I chide myself over and over again. Knowing that I have certainly lost clients over it. I’m going to watch for that and remind myself of your term ‘comprised care’. After 22 years as a MT I might be ‘getting it’.